If you purchase this product you will earn the reward 4 USD for each! 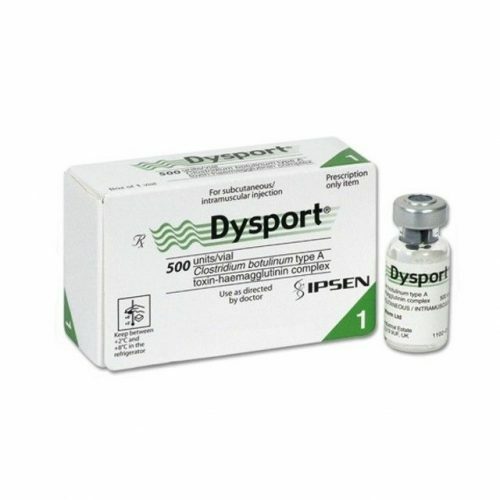 Dysport Non-English 1 vial 500U by Ipsen is a botolinum type A product. It`s a complex of purified neurotoxin type. By a series of precipitation, chromatography steps, and dialysis it is purified from the culture supernatant. The neurotoxin consists of hemagglutinin proteins, non-toxic nonhemagglutinin protein and neurotoxin. So it used to treat cervical dystonia, lower limb and upper spasticity in pediatric patients, and corrugator muscle activity. You can buy Dysport online from FillerSupplies.com in the USA. Before using Dysport Non-English 1 vial 500U first of all please check the expiration date. This product stored in a refrigerator from 2 to 8°C. Use this product within 24 hours. After reconstitution does not freeze it. Keep in a place protected from light. After opening must be used for one injection and for one patient. Filler Supplies is supplying Dysport Non-English 1 vial 500U in a sterile vial for a single use. Every vial contains lyophilized abobotulinum toxin A, lactose, cow`s milk protein and human serum albumin. There is some important information about Dysport Non-English 1 vial 500U. It has serious side effects that can be life threatening. They are spread of toxin effects and breathing or swallowing problems. This may happen from hours to a week after an injection. If you feel any of this problems first of all contact your doctor. Second step is to get medical help. Also problems with speaking, swallowing or breathing. It`s because of the weakness of muscles after injection. Sometimes botulinum toxin can spread away from the injected area. It may cause symptoms like trouble saying words clearly, swallowing or breathing. Also double vision, loss of bladder control loss of strength and muscle weakness and hoarseness or change or loss of voice. If this happens with you please refrain from dangerous activities. If you have allergic to any of the ingredients of Dysport 500U 2 vials you must tell it for your doctor. Also if you have allergic to cow`s milk protein or any botulinum toxin products or if you have skin infection in the injection area. You can look for other DYSPORT products here.